Is it ruffle? A flounce? Whatever you call that detail it worked out really well for this silk chiffon fabric that had a bit of a shaky start. I've been wanting to make something with this type of flounce for quite a while and I had always liked a particular Burda magazine pattern 05-2017-109. But maybe not enough to buy the PDF and print/tape etc. 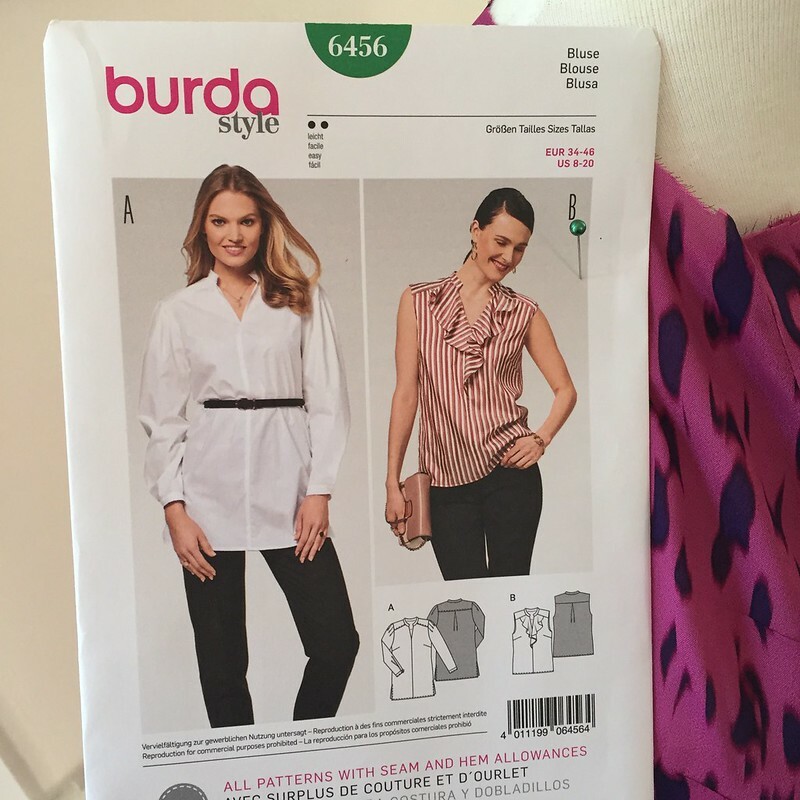 So one day when Burda envelope patterns were on sale and I was scouring the pattern catalog for hidden treasures I came across this one, which is Burda 6456. Slight difference as it has a set in sleeve and the magazine pattern has raglan seaming but the same general idea. So thank you Burda for a printed pattern :) which makes things so much easier. 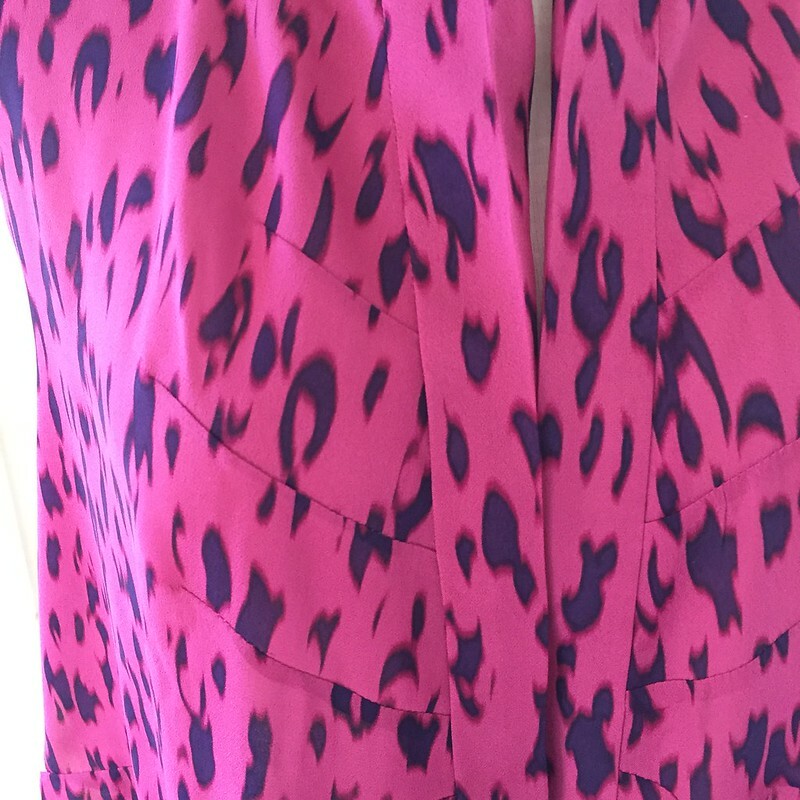 This pattern is ideal for silk chiffon, and as it happened I had ordered this silk on a whim from Fashion Fabrics Club on a whim, I think it was quite inexpensive but when it arrived I loved the color and the feel of it. Pattern love on this one. Quite easy to sew and silk presses so well that the edge on the flounce was not too difficult. I (briefly) thought about trying the narrow hem foot but really that is just about impossible to use on most fabrics and even more tricky on curves. Or maybe you can get it to work but I admit that foot is my sewing achilles heel. (ha ha bad joke intended). No matter - didn't need it. Slightly wacky print. Is it just an abstract? 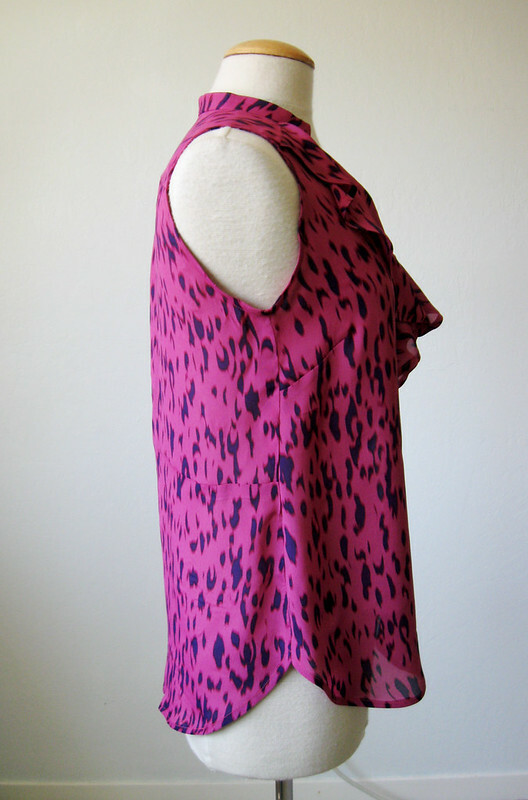 or some variation on leopard print rendered in deep pink and blue? Anyway that pink is one of my favorite colors. Here's the pattern envelope. I could see making the flounce version but with long sleeves for the winter. It has just enough of a collar to satisfy my "I need something on the back of my neck or I will be cold" requirement. But this top had a bit of a circuitous route to get here. I started making a shirt from a winter Burda magazine, I forget which one, maybe Feb. The shirt that had the diagonal darts along the center front button band, but after about 2 hours of construction realized the details were disappearing in this fabric and it wanted to be something way more flowy and not structured. SO recut! 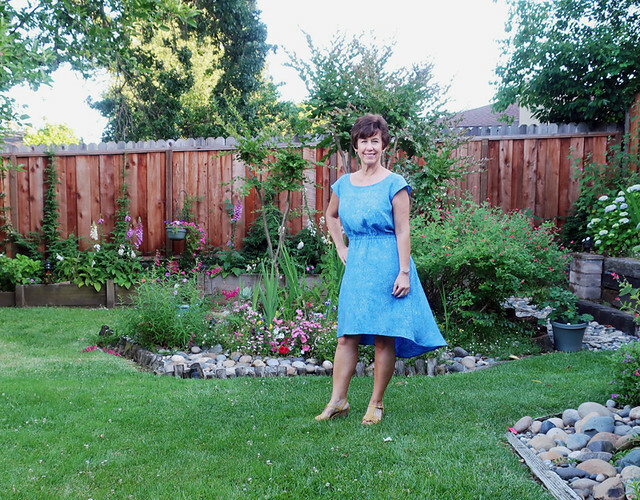 I used the sleeves to cut the flounces, used the remaining uncut yardage for the front, fortunately there was some so I could have this do-over. The back was cobbled together with the back pieces from the first-try pattern and all in all it came out OK. Here's the first version, partially done. And just why did I start with this fabric? It needs something way more crisp, a nice cotton shirting will be better and I will revisit in the fall. 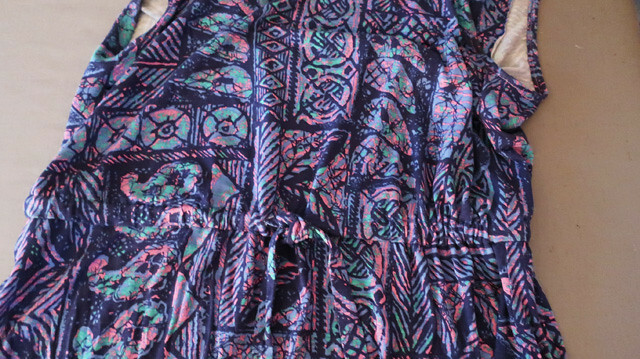 And the back, you can see the seam across the center, the original blouse had that waist seam front and back, but I think in this busy print it is fine. Side view. This pattern does have a bust dart which give some shaping. 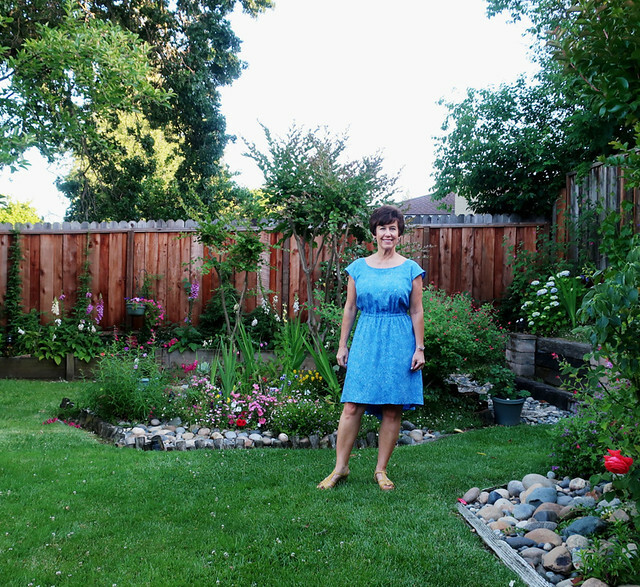 I cut a size 38 which is my usual top size in Burda and added a bit in the hips, which I always do. I wanted it to be loose and flowy. And I did cut the armholes in a bit, and then did a bias binding with the same fabric. Do you love doing bias binding with silk fabric? - it's one of those things that give me sewing pleasure. These pictures were taken weeks ago, the weather was lovely - then we had a return of "not spring" for a while, and tomorrow will be full on summer with temps in the 100's ℉. Yeah, summer is here now! And my expression is saying - hurry up with the picture taking because happy hour with vino and pizza is happening behind me. 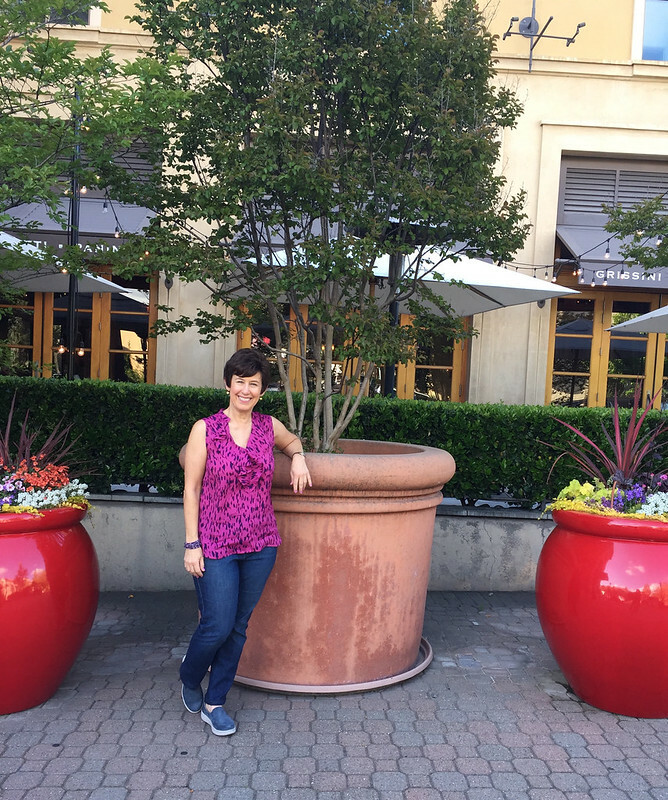 But I can hang around for just another minute with the giant red pots. Wow those would be fun to have in my garden although once they were put in place I expect they stay there forever. Tomorrow is a Skirt class at Hello Stitch and then June is almost over. They are closed the week of July 4 but when they return from that vacation break we have all kinds of fun classes. 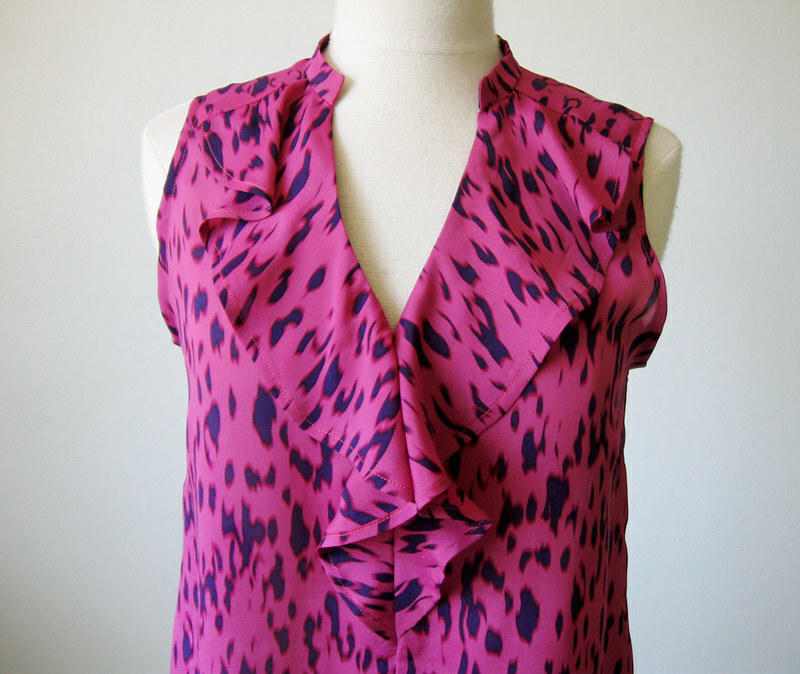 Garment Copying (July 22) is really popular so we are offering that again. Same with Pattern Fitting: Adjust the Bust, that will be offered again (July 15). A couple of dress classes coming up as well, our Bondi dress class (Aug 12) and a Sew a Wrap dress class (Aug 4, where you can use any wrap dress pattern you like). And a new class I have created, Pattern Hacks: Add New Elements to your Patterns (July 28). I know some people object to the pattern hack terminology and others embrace it fully - I'm kind of in the middle but it does perfectly describe what I will cover - how to change up your existing patterns and get more mileage and looks with your existing patterns. Totally do-able! and very efficient when you think about doing that instead of starting with a new pattern. Hope to see you there. 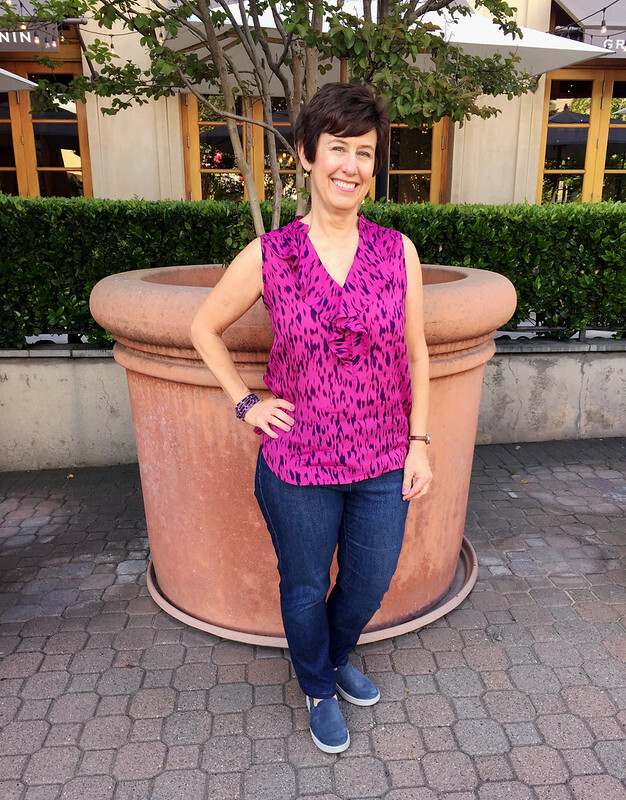 Social sewing news: Last Friday I had the opportunity to meet an east coast sewing blogger in person. Renee, whose blog is missceliespants.com was on vacation and covering California from LA to SF and many stops in between. 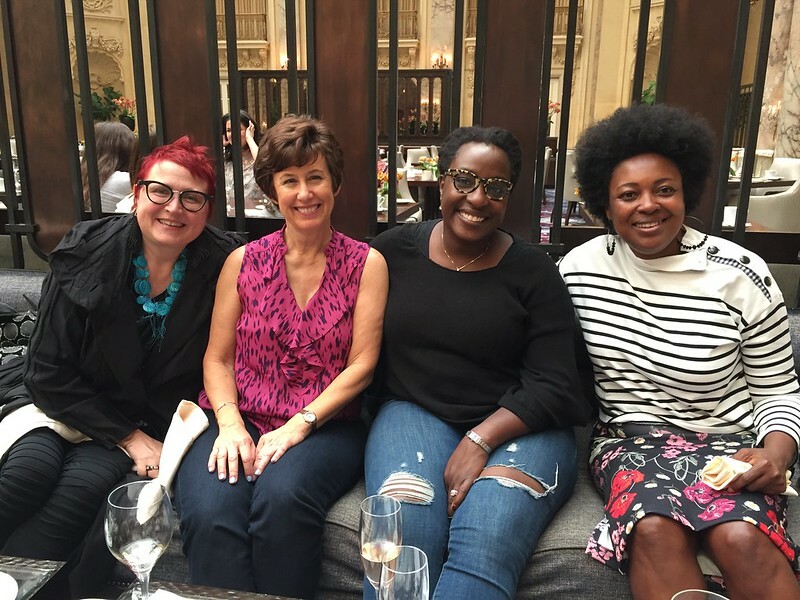 A group of us met at Britex and ogled the luxury fabrics and then marched down to the Palm Court at the Sheraton Palace (led by @naughtybobbinpatterns, our pied piper of champagne) for bubbly and conversation. 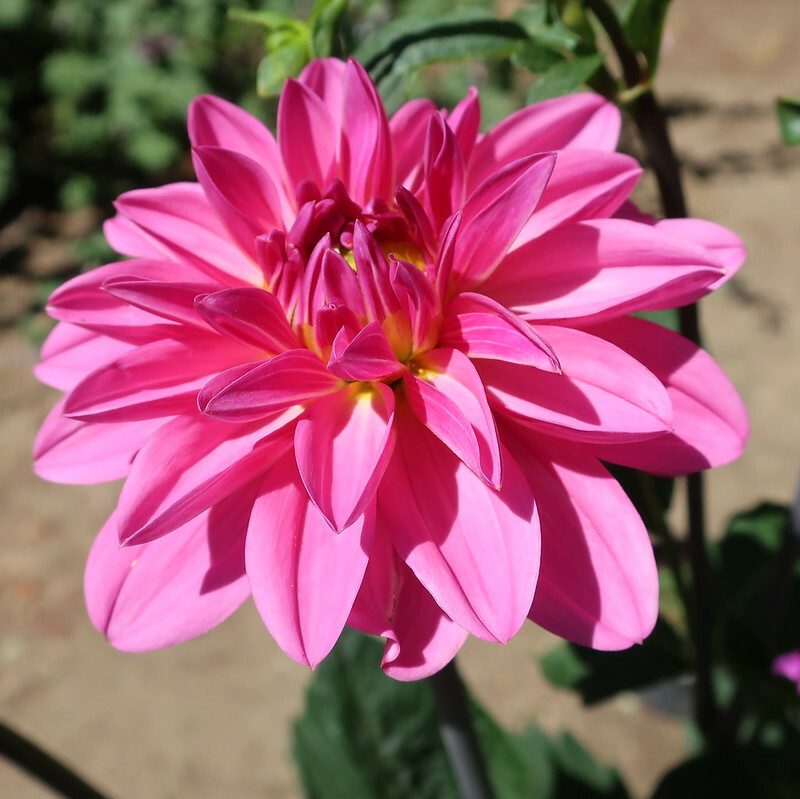 today's garden photo - a bright pink dahlia. This one is about 4 feet high and still growing. First up, Do you do after-the-fact fixes? By that I mean adjust or alter a garment that you have sewn, and likely worn, after it is completed. I do this all the time. Well, not all the time but often. Here are some things I have done: changed sleeve length, changed hem length (those are probably common). Adjusted the center back zipper - even to taking it out and altering fit there and then sewing it back in. Changed a facing to bias binding. Changing armhole shape. Narrowing shoulders. Adjusting sleeve width. Changing the buttons (rarely - as I hate sewing on buttons). Changing the neckline. Adding a drawstring or changing the elastic. Even adding more interfacing if it was possible and I thought the item needed it. All in all, I figure if I liked it enough to finish it and wear it, then a small issue that bugs me can be fixed, and I will like it even more. My most recent fix is this knit dress. It had an elastic waist and then a tie sash, which didn't seem to add anything. Also I made the elastic too short so it was fine when standing but when I sat down it wanted to roll upwards. I I took out the elastic, added two buttonholes at the center front, made the elastic about 3/4 of my waist measurement and then made a couple of 1/2" ties which I attached to the ends of the elastic. So now it is a drawstring, with elastic, which is a really nice way to do a drawstring, super comfortable and you never need to adjust it as you wear it. So a tiny refashion and now this dress is 100% satisfactory. Pocket placement: Do you have an ideal pocket placement idea? I mean the patch pockets on the backside of jeans. When I look at pattern details I feel like Goldilocks - pockets too high, pockets too low, and then just right. Of course just right is in the eye of the beholder. And this beholder likes them right in the middle of the bum, above the crease formed where your cheek meets the top of the thigh. This is for women's jeans, men's are a whole different category. Just personal preference, to me the pockets look out of proportion or misplaced when they are partly on the back thigh. Where they end up has a lot to do with a person's body shape, and length of rise, and if the jeans are high waisted or low rise. You see this more often on guys, I think because on most men their jeans are not held up by the hips as women's usually are, so they tend to migrate downwards, even if they are not intending that look. Sometimes I see a guy with his jeans pockets somewhere south of what looks comfortable (or safe) and you can see the outline of phone and wallet. That's when I think isn't that uncomfortable and or possibly hazardous to your phone screen to sit on it all the time? As a relatively short person 5'3" with a long rise I have been making pants and jeans and thus scrutinizing my backside pockets. Not the most fun in the sewing room but worthwhile to get a fit I like. News stories about the business of fashion: I love to read business stories that cover fashion and the apparel industry. Inside scoop on a Paris fashion house or behind the scenes peeks at a major magazine or line, yes please! I recently read this one on Bloomberg Business News about LuLaRoe Leggings and the problems with that firm including the speculation that it is a multi-level-marketing scam in addition to a clothing company. Also inter-family drama. Also my opinion - they look like toddler clothes for grown women - which should be the real scandal. Custom fabric to the extreme: did I show this link before? let's turn to something that made me laugh out loud. And actually show it to a family friend who I thought might want one of these pillows. Result: she did not. Vintage Singer Buttonhole Attachment: I love my older Singer sewing machines and think that they make the best buttonholes. Plus they do the Keyhole buttonhole which looks so professional on a jacket. Recently Morgan (@crabandbee) posted a pic of a recently inherited sewing machine which is the same model as one I have. She asked about some of the accessories so I figured I would sift through my photo file and find the slightly blurry video I made a while ago of the buttonholer in action. Here's a link to a post I did in 2011 (!) 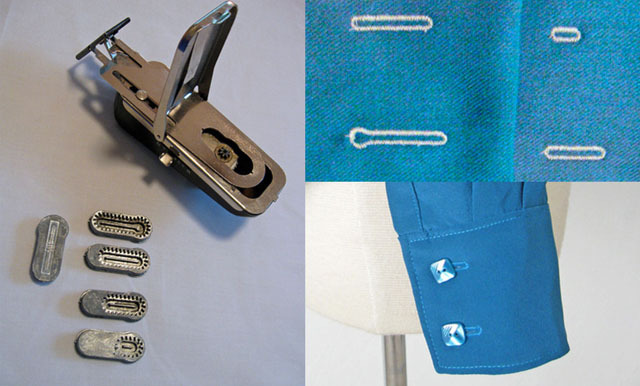 with lots of info, photos of the various parts that are needed for the buttonhole attachment and how they work on the sewing machine. And the video. I just tried to upload it here and it is taking forever, but if you click over to the 2011 post you can see it there. Topstitching - what is it about this that people love? I like the look of it but I can take it or leave it. Some things look nice with it and I do it but it's far from my favorite component of a project. Some stitchers go into raptures over topstitching...maybe people who love order and tidiness and get a thrill out of those perfectly uniform stitches marching across fabric. 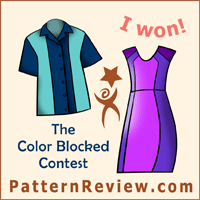 Pattern Review website - do you use? I think a lot of people would agree that it would be great to have a website that incorporates the fun and friendliness of Instagram with the usefulness of Pattern Review. And had a better visual appeal (with no brown - websites with brown graphics are sort of sad looking). I use PR for pattern evaluation, it's really useful to see the combo of photos of a pattern sewn up, the fabric choice, how it looks on different body types and then read a few paragraphs on the pluses and minus of the design, construction and what the individual person might have done to change up the pattern or make it easier to sew. I also look on Instagram but the specific search result on PR is quite handy. I post reviews because I figure if I am going to use it (for free) I should contribute in the same way. Instagram is a more fun interaction but I am always wanting more info and details than the snippets people post. Picky picky, right? What makes a well drafted pattern? I see this phrase used often and sometimes I wonder what the person meant by it. It can mean that it sewed up correctly? That the pattern pieces fit together easily? It could mean that it fit well for the size that they chose. It could mean that the designer took into consideration the drape of the fabric and thus it resulted in a nice garment. Maybe just that it was really on trend and so gave the stitcher the item they wanted for right now. Sometimes I see this phrase used and I think the pattern they are referencing might have sewing together with no problems but the torturing of that fabric has turned out an awful result. Interestingly I don't think you can apply this designation to any particular pattern company, each one has some things that go together well and others that look like they were trouble from the get-go. I just sewed up two different wrap dress patterns from the same pattern company, one was great and one was a problem child so I might have more to say on this topic soon. What is with the terrible darts on the red carpet? I think the most famous offender is Prada and this dress might be from the same design house. I saw this during the coverage of the Cannes film festival and that satin fabric is not helping the matter. But eek, that is not the way I would want a dress to look when being photographed a zillion times. Although the jewels are quite something. At Hello Stitch Studio: still some spots in my Pattern Reading class this Thursday night 6/14, and then my Skirt class on Saturday 6/16. The studio is closed during the week of July 4. 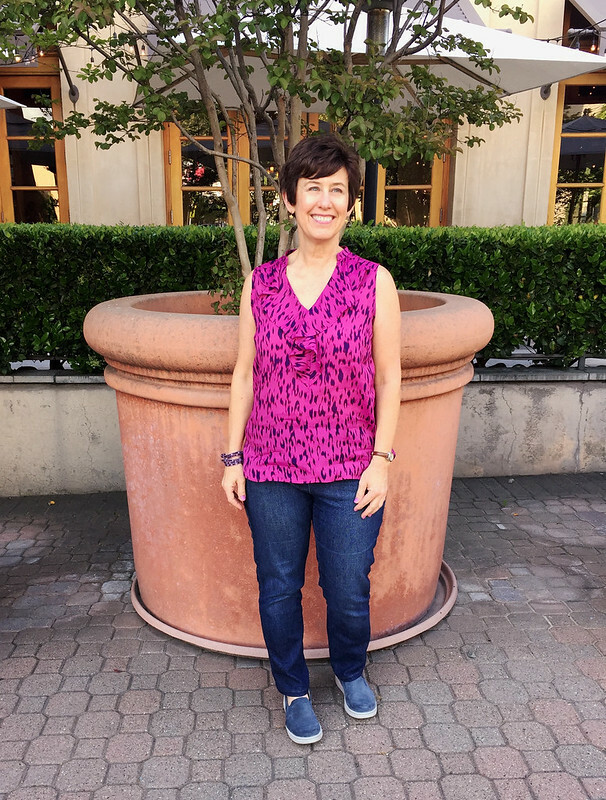 In July we have a Pants Fitting class (limited to 4 people) and also a Button front Shirt class (Tues. 7/17 in the evening) plus another Bondi dress on Aug 12. 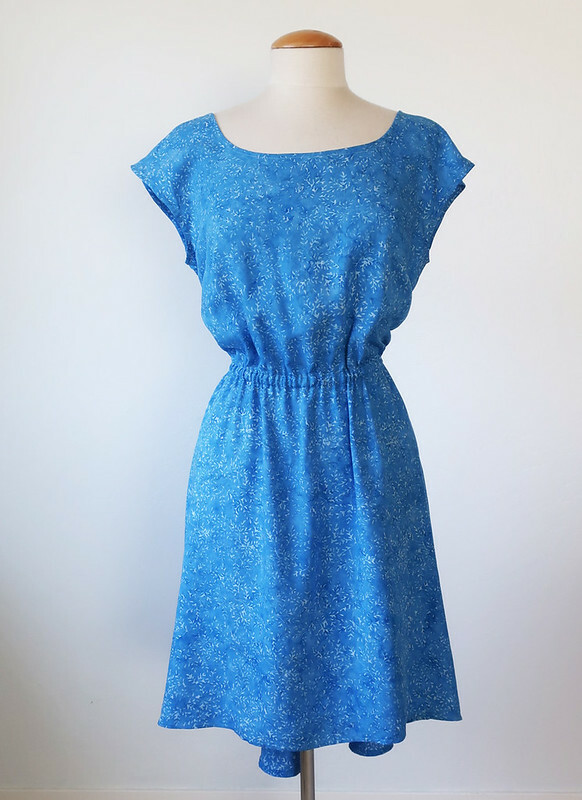 Everyone is making such cute Bondi dresses - it is the ideal summer dress. 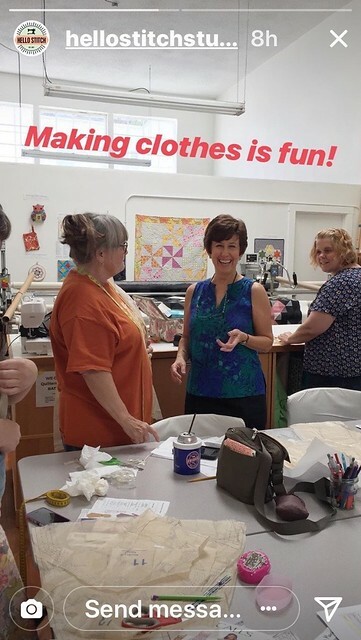 Pattern fitting and adjustment classes include the Pants class mentioned above, as well as another Adjust the Bust pattern fitting (7/15) another Garment Copy (7/22) and a Pattern Hacks class (7/28). All garment classes are here. So plenty to do this summer, and the weather is heating up, which means I can wear my summer dresses, yay! And a sewing meet up with friends later this week that I am really looking forward to. 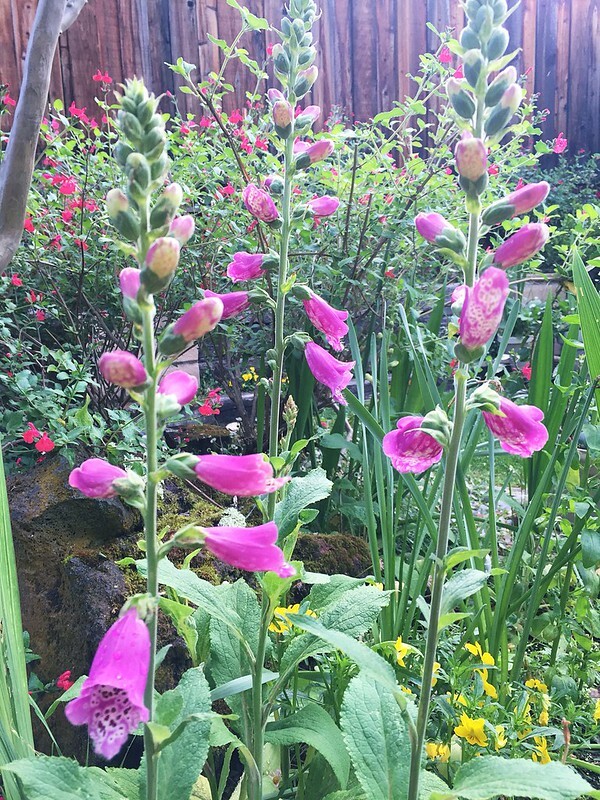 today's garden photo, there are so many foxgloves blooming, in shades of white, pink and purple. They even seem to self sow, which I hope means more blooms from the smaller volunteer plants later this summer. Do you ever finish a project and think, yes! This was the perfect fabric choice for that pattern. 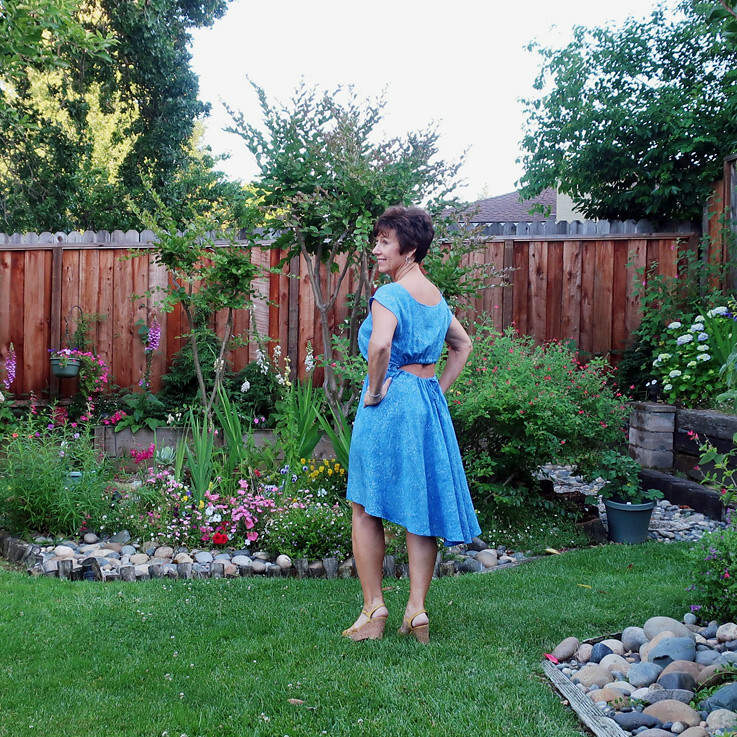 I recently had the opportunity to choose a fabric from The Confident Stitch, which is a gem of an independent fabric store in Missoula, Montana. I met the owner Kate a few years ago when she came for a fitting lesson. She has bay area roots but has lived in Montana for many years. Kate decided to open a fabric store which sounds like a dream but I imagine is a lot of hard work along with the fun of thinking about fabric all the time. On their blog they have great versions of indie patterns sewn up with their fabrics. I like to see how things look on real people, instead of illustrations, don't you? In particular they have sewn up versions of the Sew House 7 patterns which make me want to stitch up those immediately! Looking at the website, I had a really hard time choosing as they have a lot of lovely knits, cottons and double gauzes however I will always gravitate towards the tropical and the turquoise blue, so I chose this woven rayon Island Batik. I chose the fabric first, with no plan. And then had to think about how to use it to take best advantage of the weight and drape. In the end I chose a pattern which fit into my vague plan to try new silhouettes and shapes this year. How's that for something different? This is the first time I've ever sewn something with a hi-lo hem. Admittedly not a drastic one, but it does have that lovely swishy feeling as you walk around. And not to overlook the other feature of this pattern, the opening at the center back. 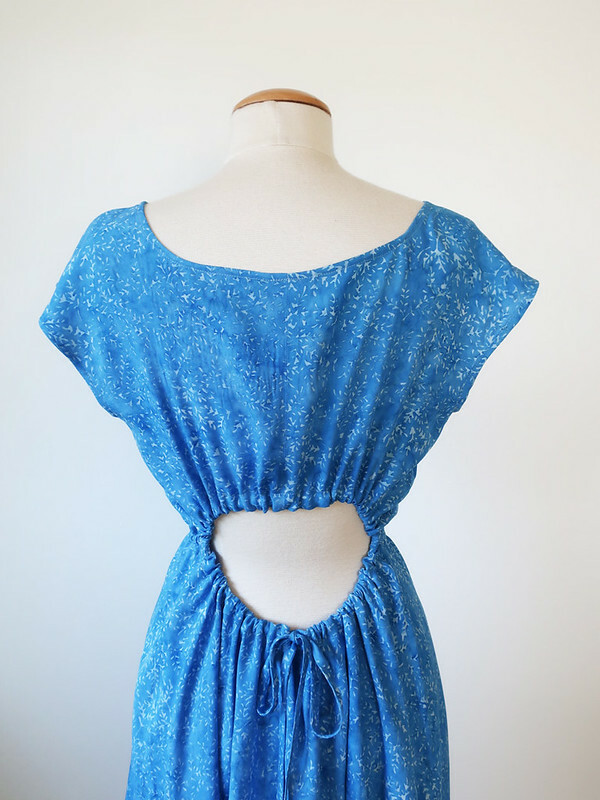 This pattern is super easy to sew, and has an elastic channel in the front, then the opening has a drawstring all around the opening which you can make more gathered or less, depending on how much of your backside you want to show. Seriously, so easy! Just 4 main pattern pieces, a facing for the back opening to make the casing, a bias binding on the neck and then turn and stitch hem for the sleeves and hem. Here's a look at the pattern from the BurdaStyle website. Now I notice that they are also leaning into the "looks good with the wind blowing" aspect. 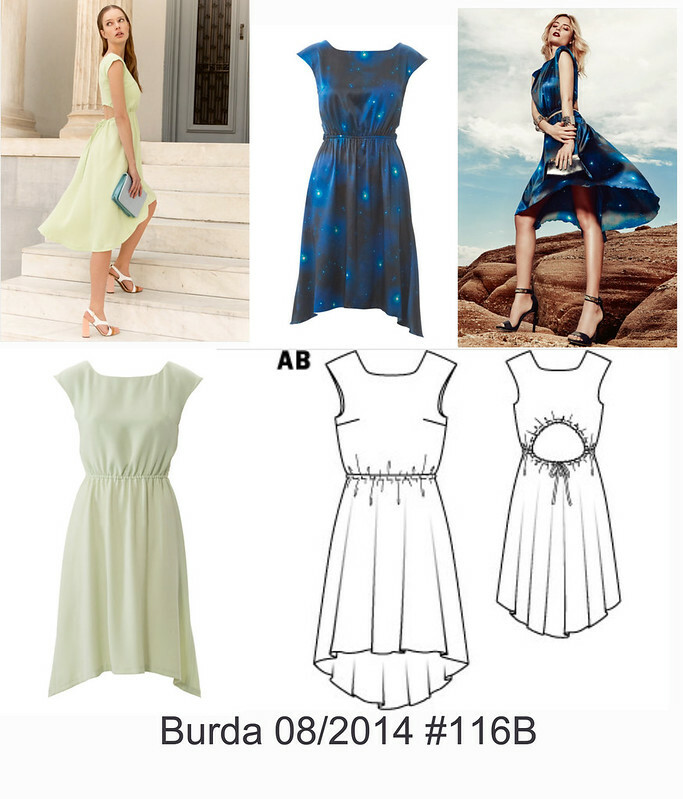 So Burda...from August 2014. Yes, I saw this dress ages ago and always wanted to make it. When in doubt of what to do with a fabric, I look at the various pattern websites, especially BurdaStyle because they have a lot of dresses with interesting features. It might be that I'm not interested in actually using their pattern, often I have a similar pattern in my stash already but the inspiration is helpful and I do like their tech drawings. Changes - I think I shortened the whole thing about 3 inches - but note I am 5'3" so typically shorten everything. I lowered the front neckline about 2 inches at the center front. The drawing looks like a scoop neckline but it was too high on me and I like the way the back looked. Otherwise no changes. I cut a size 38 and graded to a 40 at the hip, but I probably could have made a 38 all over, it has plenty of ease. The only other small nitpick is that I followed the pattern when placing the buttonholes at the center back which the tie threads through to the outside, and they are a bit too far apart (about 2.5 inches) As it is, when the bow is tied there is about 2 inches of fabric that isn't gathered up. However it doesn't show so it's not a problem. I also thought about making it a sleeveless look, as I usually don't like cap sleeves but I am SO glad I didn't. The shape looks perfect and cap sleeve balances out the rest of the details. 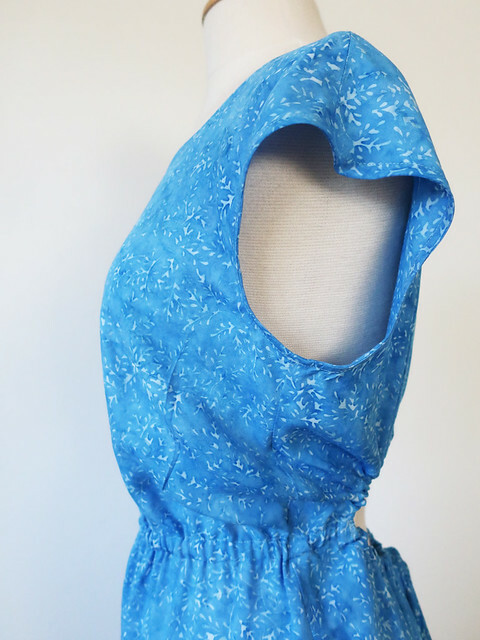 The color of this fabric is so pretty - it's like the perfect blue sky on a summer day. They have a number of these Island Batiks at The Confident Stitch. 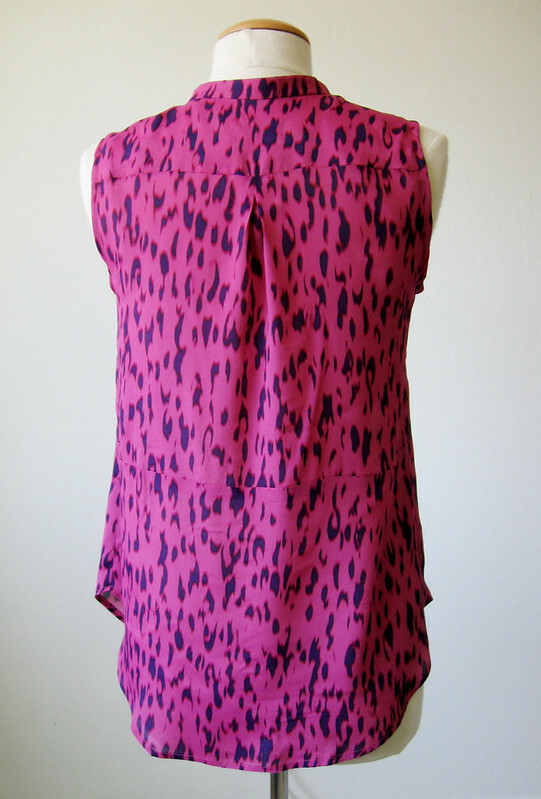 It would be a good choice for a similar easy fit dress, a tunic top or a maxi skirt. There is a bust dart which gives nice shaping to the front, and all but disappears in this fabric. It was really windy when I took these pictures - which worked out for the best. 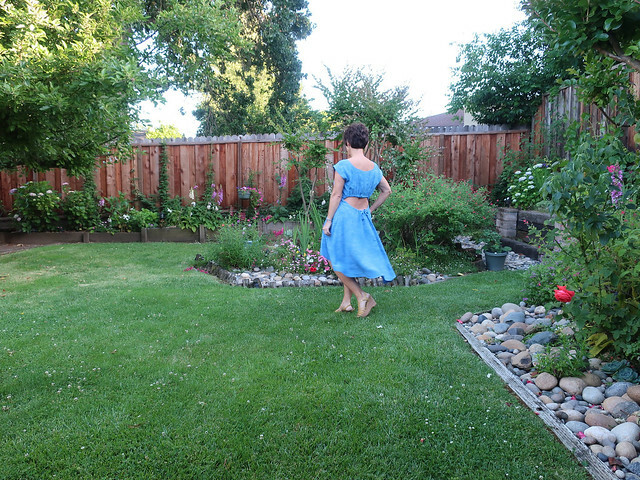 So that's the latest on my new dress with fabric from The Confident Stitch. I can't wait for a warm evening to wear it out to dinner. Next up, a Random Threads posts is in the works, and then my other recent sewing projects. Which are Not Blue! I just looked back through my blog posts for the last 5 months and the majority are blue. Not intentional and time to change color course. Speaking of Patterns - I am really excited about a new class we have put on the schedule: Sat. 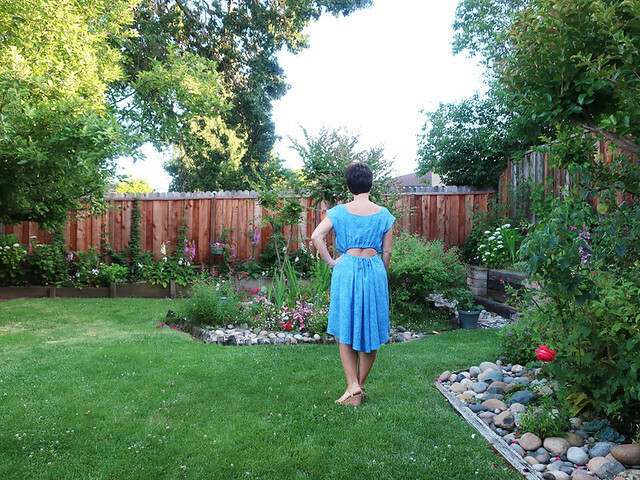 July 28, which is Pattern Hacks: add new elements to your existing patterns. 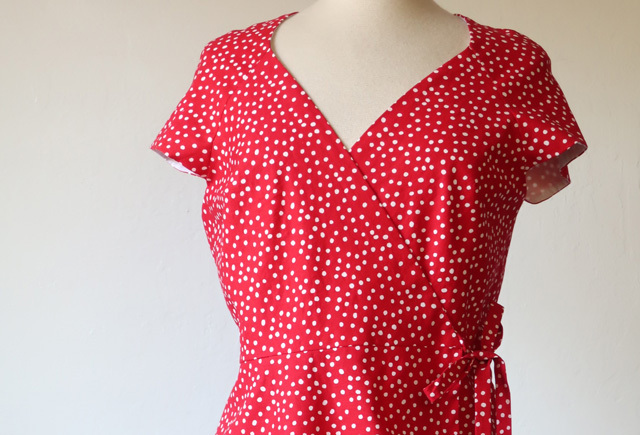 You know I can't leave a pattern alone - so this class will cover how to make changes and hacks like redesigning the neckline, combining 2 patterns together, adding pockets, or plackets and just getting more mileage out of the patterns that you currently sew. Like some of my the other pattern fitting classes this will be a workshop style class where we slice and dice sample pattern templates in order to learn how to make these changes. Sat. June 16 and 23: 2 morning sessions Skirt class, pencil or a-line skirt style, you choose your pattern. Sat June 16: 2pm Knit t-shirt. I think this class is close to sold out - so if you are interested hop over and register. Thurs. 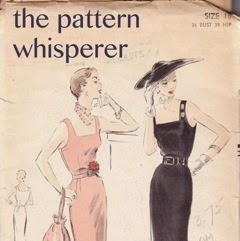 June 14: 6-9 pm How to Read a Pattern, I really like this class, even if you have sewn a few patterns already it is a great overview and discussion of what makes a good pattern, how to get the most info from the pattern envelope and pieces plus choosing the right fabrics for success. In July we have a Pants fitting class (Sat. July 14) and another session of How to Copy a Garment class (Sun. July 22). In August we will have a wrap dress class....so something for everyone I hope. Link here to the Hello Stitch Studio class listing page. People who sew are SO interesting! I have met such fantastic people in every class and as one person said on Sunday, it's just great to spend a day with others who want to talk about sewing. I agree with that! I was going to skip my garden photo - as you get a glimpse of all the foxgloves in the background there plus the hydrangeas just starting to have blooms, but I did get a new camera. And this is the time of year when there an abundance of things to photograph. 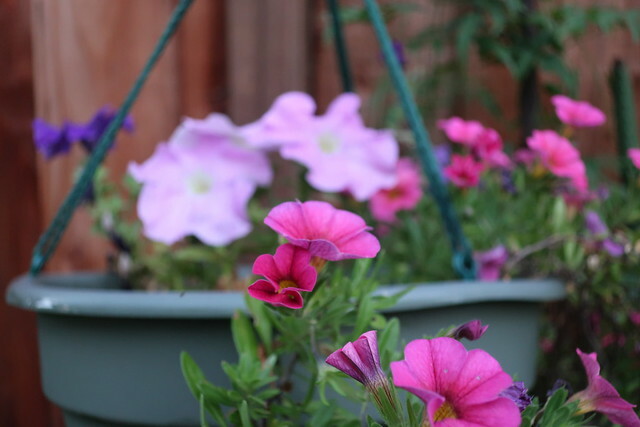 Hanging basket with petunias and a calibrachoa which has survived through the winter. Plus experimenting with focus.